3rd September 2009. After many vicissitudes we have finally sold our house in Filkins. The movers pack everything up to take it into storage. The couple buying the house are so keen to move in, they are happy to take the keys off us as soon as the removals van is loaded. This means that we have to find somewhere to stay until our ferry - we stay in the Five Alls our local pub for 3 nights, so not really a chore. The only family member a bit puzzled is Bertie, our Clumber Spaniel, who has to sleep in the back of the Discovery, but he gets lots of walks to compensate. 4th September. A gratifying number of our friends turn up for our leaving party in the pub. Lots of good wishes, cards and presents. Also lots of people who promise to come and visit us! 6th September. We catch the ferry from Portsmouth to Cherbourg. It's a very reasonable 3 hours, although Bertie's comments from the back of a car that is now moving up and down are not recorded. A couple of hours from the ferry port we spend the night in a nice little hotel, which, much to Bertie's relief, has a small park right next door. We decided not to start the formal buying procedure in France until we were absolutely sure of our UK sale. This meant, according to our French estate agent, that the legal process overseen by the Notaire would take some 2 months. 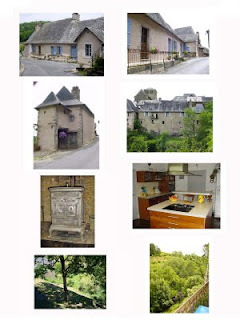 We were lucky enough to be able to rent a house in the Dordogne from a friend of a friend, so thats where were headed. We kept in touch with agents, and met up at the Notaire to sign some preliminary paperwork. To our surprise the Notaire announced that we could complete on Saturday 19th September, much earlier than we thought! 19th September. We all meet up at the Notaires, Judy and I, the vendors M and Mme Morant, the Notaire and our estate agent Peter van den Berg, who translated for us. After signing our names to what seemed like a huge number of pieces of paper, we had a house! We had transferred the money from our UK account to our French one, and I was a bit disappointed that we had seemed to hit a low in the rate. In fact it kept on falling, so if we had had to wait a few more weeks we would have lost a fair bit on the exchange. 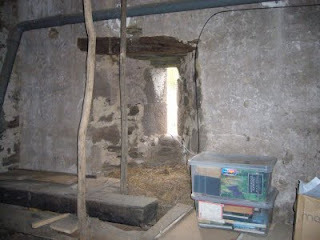 We accompanied M and Mme Morant to the house where they gave us all the keys, and showed us what everything did. Madame had spent 4 days cleaning and polishing the house, and it was spotless. The only snag delaying our move was that the removals firm couldn't slot us in until the 30th... so it was back to the Dordogne to wait. 30th September. Our big day. The removals men turn up on time, and get everything in pretty quickly - helped by the fact that we have 3 front doors! They are gone by lunch time, and all we have to do is unpack a huge number of boxes. At first we thought a couple of things were missing, but one turned up in the bottom of a packing case a few days later, and the last item about 3 weeks after that. One little problem showed itself as we drew up outside the door that morning. Judy pointed out a slowly spreading pool of water under the car, which turned out to be a leak from the heater matrix. Luckily I had taken out breakdown cover, so the nice man from Green Flag came and winched me onto his low loader and asked where I wanted to go. The nearest town to Voutezac is Objat, some 10 minutes away. As we had driven through, I had noticed a small garage which always seeme to have Land Rovers and Discoveries outside, so I said we would try there first. The owner is not only a Land Rover expert, but he also speaks excellent English. He made a temporary repair so we could keep going, and said he could repair the car, fit left hand headlights and otherwise prepare it so I can register it in France. Result! 20th October. Lets get up to date. We have settled in very well ! We have bought some new furniture, some of which is in and the rest should be delivered tomorrow. We also have new curtains on order. We have begun the registration with the French health service, and found an English speaking doctor. The nearest town is Objat, a very pleasant place with a good selection of shops including several supermarkets. Each Sunday a large market takes over the whole town centre. The large town of Brive is about 20 minutes away, with all the shops you could want, with a particularly attractive town centre with cafes etc. We are off there later this afternoon, looking for rugs. We plan to have two bedrooms and a shower room in the attic, with a few other improvements. 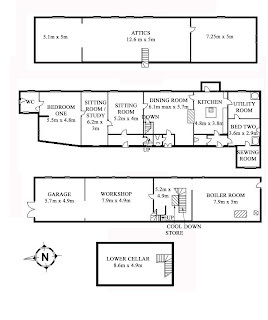 As you can see from the floorplan we have lots of scope.